The above definition tells you WHAT they are.So we know that Age Spots are really fro the sun. Age Spots can also be removed with a good laser. Age spots are from the sun, not age! Even though they are from sun damge. You usually find them popping up all over after your 40th birthday or so. It typicall takes your body a few decades of repeated sun abuse for them to begin to pop up. Thus suggesting they have arrived because we are aging. It doesn’t matter if you you treat them in your thirties or fifties.Removing sun spots is pretty easy with the right laser treatment. When our skin decides to protect itself from the sun,it creates a barrier of darker skin (hyperpigmentation or Age spot). When you use a 532 wavelength on a YAG-nd laser properly. It will target and destroy only the affected cells and leave the healthy ones as is. 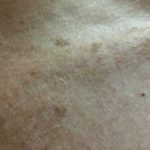 When lasering age spots they typically resolve themselves in three treatments or less. It depends on the clients fitzpatrick scale rating and overall health. When removing age spots from darker skin, there are additional risk factors. Asian and darker skin tones are more likely to react to the laser by hyperpigmenting. Which is not what we want. 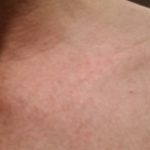 Always make sure you make informed decisions before seeking treatment for any skin conditions.